Today on my usual day about spinning, I wanted to show you my newly finished fluffy Polwarth yarn. Sadly, the light is terrible so I'm not even going to try and take photos of it. Luckily I have something else spinning related to talk to you about today. I recently received a package from the UK publisher of a new book. It contained Spinning & Dyeing Yarn by Ashley Martineau, to review. As with all the reviews I do on this site, I will give my full and honest opinion, and though I received the book without charge, there was no obligation on me to give anything other than my usual style of review. The book itself is a very lovely thing. It is hardback book with bucket-loads of clear photographs and beautiful paper. (I do like it when books have nice thick and glossy paper, don't you?) 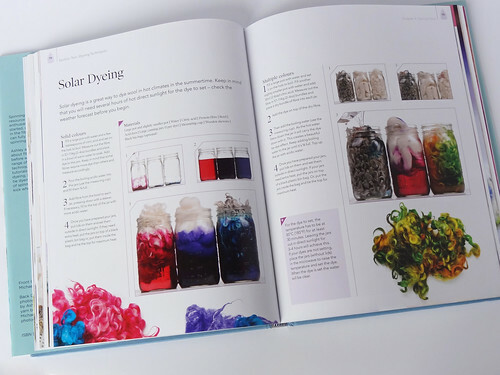 The contents of the book are divided into four sections; Section One - Fibre Identification and Preparation, Section Two - Dyeing Techniques, Section Three - Spinning Techniques and Section Four - Going Professional. Each section is subdivided into chapters and the contents pages at the front of the book clearly list the various items discussed in the books and gives page numbers. There is also a nice clear index at the back of the book, so between that and the contents pages you should be able to find the things you want to look up, easily. 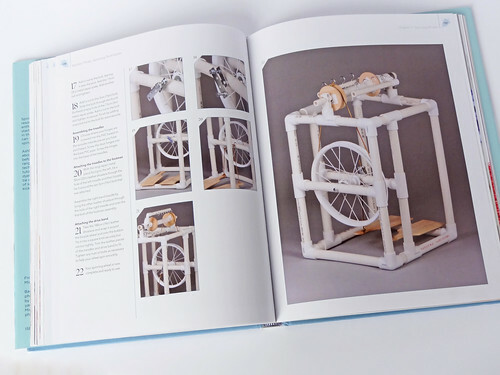 One of my favourite things about this book are the sections that deal with making your own equipment, including a spinning wheel! It gives good photos and explanations about what each type of equipment is and how it is used, and then gives tutorials about how to make versions of the equipment at home. Obviously not all equipment is easily made, but where it is possible, tutorials are given. This is great if you are just thinking about having a go with spinning. Most people don't want to spent lots of money on a new hobby, and this book will help them try new tools without spending vast quantities of money. To be honest, the spinning wheel looks pretty complicated and I think you would need to be handy with a saw and a drill, but if you brave crafter you may be tempted to give it a go. I like the small sections, throughout the book, where people who work in the fibre industry are interviewed about their work. For example, a shepherd is interviewed in relation to buying fleeces direct from the farm, which is in something most beginners probably wouldn't consider.Talking about the sheep and how you would process a raw fleece may give a reader confidence to give it a go. The dyeing section was of particular interest to me as I have only just started my journey into this field. There are several different methods outlined, on how to dye different fibres and has techniques that I am interested in trying. I don't think I'll get much opportunity to try solar dyeing though as it requires several hours of strong direct sunlight. We don't get many good Summers in the UK, but it's worth thinking about if we get another Summer like last year. One of my problems with the book is that though it is a great introduction to the world of fibre, it doesn't really give a good clear explanation of what drafting is, what it looks and feels like and how to do it. The only definition of drafting I have come across, before reading this book, were worsted and woollen. However, this book refers to woollen and aran drafting and states that woollen drafting feeds the fibre forwards into the twist and aran refers to having your front hand hold the twist and pulling the fibre backwards before letting the twist travel up by moving your front hand back, towards the back hand, controlling the twist as your hand travels. I have not come across the term aran drafting, but of course, I am a beginner spinner so it may be that I've just not come across this term, because nearly all I've learnt of spinning has been from American publishing and websites. This version of the book has been published for a British audience, and the spellings make it obvious that they have changed terms for the UK, so it may be that in UK spinning guilds I would be taught these terms. I don't think a complete beginner could learn how to draft properly using only this book. A beginner would probably have to watch videos or read further tutorials to understand what they were doing. The book really focuses on spinning with a wheel rather than a spindle, though it shows some techniques on a kick wheel. I think this may well be a route lots of new spinners take: trying to spin on a spindle, possibly using a home-made one, as in the tutorial in the book, deciding they like it and buying a wheel. The book then jumps straight to creating many different types of art yarns, which is what the book focuses on principally. 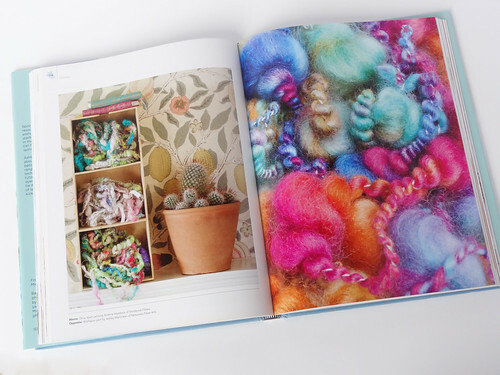 The sub-title of the book is The Home Spinner's Guide to Creating Traditional & Art Yarns. I think the "traditional" part of the title is over stating it somewhat. This book essentially focuses on getting a spinner to the stage where they create art yarn as quickly as possible. I feel like the middle step of learning to spin is missing from the book. It introduces basic equipment and then jumps to spinning art yarn on wheels. There is no middle ground where you learn to spin basic, consistent yarns in a way that the spinner decides. Because of this focus on art yarn, I wonder if the book would have been better served by excluding all the basic information at the beginning of the book and adding more to the latter parts of the book. 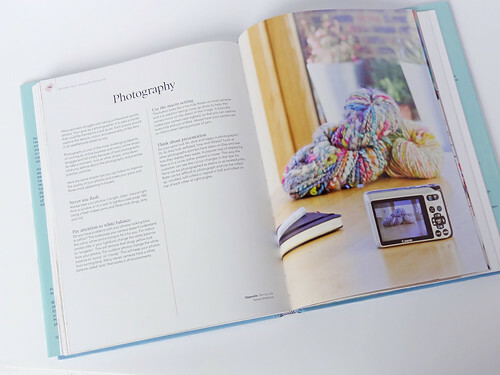 The final section of the book, relating to becoming a professional spinner, has several useful subjects, the first of which, relates to photography. It even shows you how to make a cheap lightbox to take photographs for a shop. However, even if you don't intend selling your yarn, this will be useful for any blogger, or someone wanting to take a good photographic record for listing your finished yarn on Ravelry. There are several good tips about selling any crafted item, moving from a hobby into becoming professional, however, this area of the book doesn't go very far in depth. The resources section is very good, as the book has been re-published for the UK, so includes some UK resources as well as US ones. This is very useful information to have, if you looking at developing your hobby, even if you don't want to go professional. In summary, I like this book. It has lots of interesting information that covers a broad range of information. I think there are many books that go in depth in a very specific area of creating yarn, but there are few that touch on so many subjects. It would be a good book for someone to use as an initial resource to give you starting point to find out if you want to go further in a specific area, and then go on to do more studying. It shows you what is possible with spinning and dyeing and inspires the reader to try different things. The publishers of this book have very kindly offered a discount from the RRP of £25 to £20 including UK P&P. 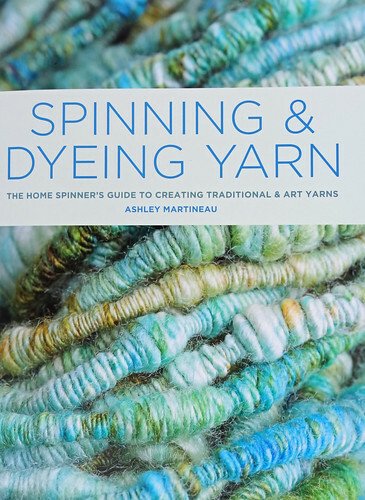 To order Spinning and Dyeing Yarn by Ashley Martineau for this reduced price, telephone 01903 828503 or email mailorders@lbsltd.co.uk, quoting the offer code APG73 and the book ISBN 9781909342460. The book is released in the UK on 20th February 2014.